"Salmon fillets are grilled in foil packets with a deliciously tangy marinade! Serve with a salad and toasted bread or baked potatoes." In a bowl, mix the lemon juice, soy sauce, white wine, mustard, and honey. Season with salt and pepper. Place each salmon fillet on a large piece of aluminum foil. Fold the foil around the salmon on all sides, forming a basket shape. Pour equal amounts of the marinade mixture over each salmon fillet. Tightly seal the foil packets. 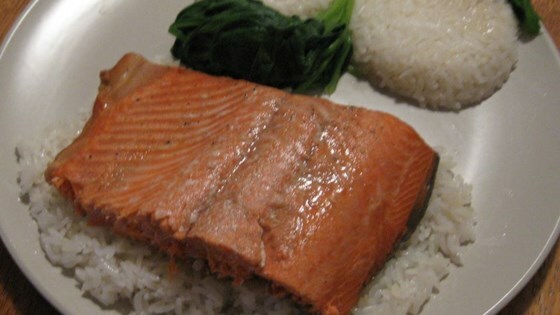 Allow salmon fillets to marinate at least 1 hour in the refrigerator. Place foil packets on the grill, and cook 10 to 15 minutes, until salmon is easily flaked with a fork. I marinated about 15 minutes and broiled it in the oven. The salmon turned out great!